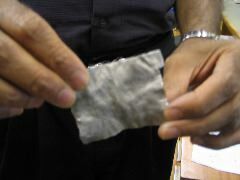 We illustrate here the high-pitched "cry" emitted by indium when it undergoes plastic deformation by mechanical twinning. Tin exhibits a similar phenomenon. You can listen to the cry on the sound-files listed below. 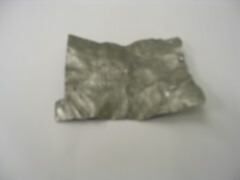 A piece of pure indium. 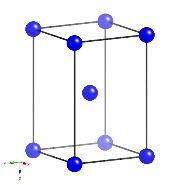 Indium has a tetragonal-I crystal structure, space group I4/mmm. It melts at 429.75 K.